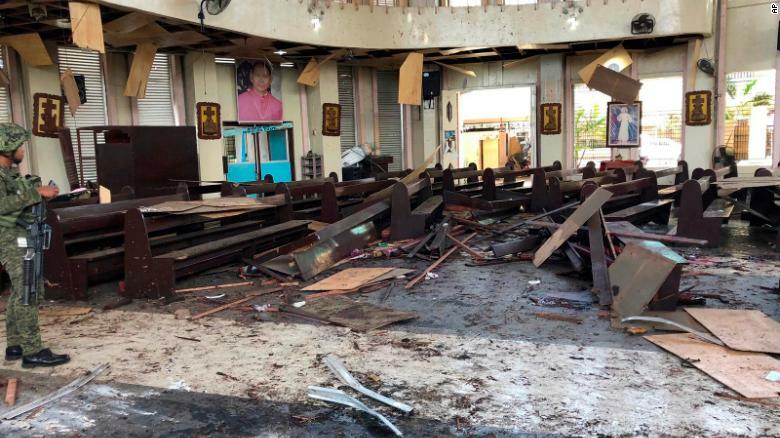 Two bombs tore through a Roman Catholic cathedral in southern Philippines on Sunday, killing at least 20 people and leaving dozens wounded, authorities said.Two suspected improvised explosive devices detonated at intervals at the Jolo Catholic cathedral in the Mindanao region, according to the Autonomous Region of Muslim Mindanao. At least 81 people have been wounded, authorities said, including 14 soldiers of the Armed Forces of the Philippines and two Philippine National Police officers.The first device went off inside the cathedral, and the second one targeted nearby soldiers who rushed to help the victims of the first explosion, Armed Forces of the Philippines spokesman Brig. Gen. Edgard Arevalo said.ISIS on Sunday claimed responsibility for the bombings via its Amaq News Agency. Shortly after the Amaq report, ISIS’ “East Asia Province” also issued a formal communique for the twin suicide bombings.ISIS did not provide evidence for its claim, nor can CNN independently verify it.The nation’s military and the police are securing the area and all casualties were immediately evacuated, regional officials said.In a statement, Defense Secretary Delfin N. Lorenzana condemned the bombing and said he has directed troops to “heighten their alert level” and secure places of worship and public spaces. The Apostolic Vicariate of Jolo is a Latin Catholic missionary.In a statement Sunday, the Catholic Bishop Conference of the Philippines offered its condolences to the families of the victims and condemned “this act of terrorism,” which came days after a Monday referendum asking the majority-Muslim population whether they back a plan by separatists and the government to create a new self-administered region.The referendum asked to create a new Muslim autonomous region that could bring a peaceful resolution between the government and the rebel group the Moro Islamic Liberation Front — a conflict that has claimed 120,000 lives since the 1970s.The majority of the 2.8 million people participating in the vote supported the referendum, but the town of Jolo rejected it.The Philippines Commission on Elections announced on Friday that the referendum was ratified after counting the votes from five provinces. A soldier views the site inside a Roman Catholic cathedral in Jolo, the capital of Sulu province in the southern Philippines. 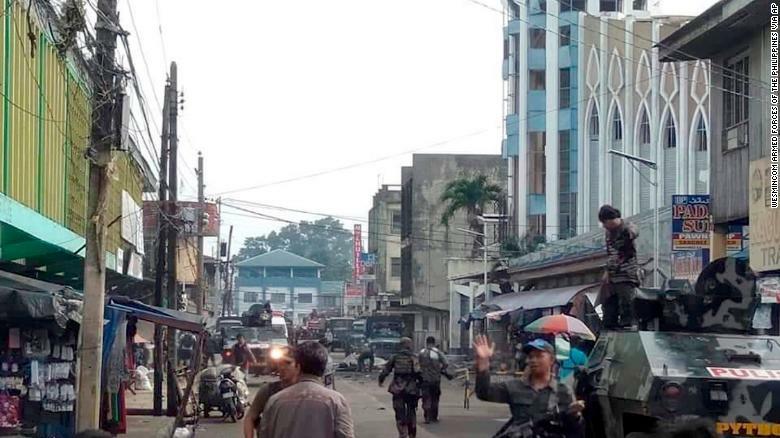 Soldiers and police cordon off the area after two bombs exploded outside a Roman Catholic cathedral.The Mindanao region has been plagued with violence between Muslims and Christians for decades.It is home to several Islamist insurgent groups, including Abu Sayyaf, which has been blamed for a number of attacks on civilians and Philippine government troops, as well as the kidnapping of several foreign nationals. As recently as December 31, two people were killed in an explosion outside a busy shopping mall in Cotabato City.In July, at least 10 people were killed when militants linked to Abu Sayyaf struck a military checkpoint with a car bomb.Abu Sayyaf — along with the Maute group, another Mindanao-based terror organization — was responsible for the invasion and occupation of Marawi, the country’s biggest Muslim-majority city, in 2017.The ISIS-affiliated militants laid siege to Marawi for five months, and the violence forced more than 350,000 residents to flee the city and the surrounding areas, as their homes were reduced to rubble by airstrikes and militant fire. In the 150 days of the Philippine army operation to flush the militants out, more than 800 militants and 162 members of the government security forces were killed.In a radio interview, regional Gov. Mujiv Hataman said the bombing is not related to Friday’s referendum, known as the Bangsamoro Organic Law.”I can’t see the connection. First of all, the Abu Sayyaf or the ISIS have not manifested their stand on BOL whether they are for or against it,” Hataman said, adding that only the Abu Sayyaf has the means and capacity to carry out the attack.”Most likely, this is related to them (Abu Sayyaf),” he said.